Without question, the back when fully developed is one of the most impressive and spectacular of bodyparts. A wide, thick and highly developed back not only highlights the entire body but is one of the distinguishing features of being a bodybuilder. Like a wrestler's bull neck, a wide, V-shaped back evident even in street clothes, tapering down to a small waist tells the world you are a bodybuilder. It's something of a trademark. When a top bodybuilder who has a great back turns around at a contest, it never fails to being gasps of amazement from the audience and to score points with the judges. Your physique is just not complete without a well developed back and all sections of the back must be developed, from top to bottom. Your back is a helluva lot more than just lats, but we'll get into all that soon. For now, think of people with greats backs and imagine where they'd be without a great back. Take away their back development and they'd be shadows of themselves. No doubt about it, a great back contributes enormously to a fully developed physique. On the other hand, many a man can look good from the front, only to fail when a flat, weak and underdeveloped back is viewed from the rear. We've all seen people with over-developed thighs, arms or pecs, but it's pretty much impossible to over-develop the back (along with the deltoids, abdominals, calves and forearms - bodyparts that cannot be overdeveloped). To say then that the back is one of the most important bodyparts is a gross understatement. Knowing this, why do so many people neglect their back training? Well, there are several obvious reasons. Next to leg training, back training is the most strenuous. It takes a lot of time and effort to develop the back. It's hard to pump up. Finally, you can't see the back as you train it so it's not so satisfying to train as the showy chest and arm muscles. Most bodybuilders seem to forget that the back makes up over 1/3 of your total body mass (with the lets, arms and muscles on the front of your torso making up the other 2/3), and that the back contains the largest muscles of the upper body and the second largest of the entire body. They'll routinely do 10, 15 or even 20 sets each for their pecs, biceps, triceps, delts, plus ab work totaling at least 40-60 sets, but for the back they do a few sets of chins or pulldowns, maybe a couple of shrugs and figure that's enough. It's not. Hopefully this article will convince you to give your back equal time, if not more time, than the smaller muscle groups (which are more than likely overtrained anyhow). You have to realize that the back is a very large and complex structure, housing several major muscle groups and several minor ones. In fact, the back contains more muscle groups than any other area of the body. Most bodybuilders only to think of the lats when they think of the back and while the lats are very important, they are only part of the whole story. Bodybuilding has advanced so much in the last few years that all parts of your body must be highly and extraordinarily developed to be impressive. A few years ago if you had wide lats and some upper back development it was enough. Even some quite well known physique champions neglected their lower backs. But look at the backs of today. The Christmas trees and spinal erector development are outstanding! You can no longer think just in terms of lats, traps and lower backs. You must work all sections of the lats (upper, middle and lower), the large center of the back, the spinal erectors and lower back section, plus the teres minor and major, the rhomboids, infraspinatus and the rear delt. Plus all the underlying back muscles that give you the true look of density and power. From top to bottom, side to side, all sections of your back must be worked and developed. Obviously, with so many different muscles one can't just perform one or two exercises and expect to work the back properly. It takes many different exercises and lots of sets to make your back respond fully. Many more sets and exercises than are needed to make, for example, the pecs or arms grow. Bear with me for a few more reasons why you should give your back priority in your training. Physically, if your back lacks width and thickness you will look unbalanced and unsymmetrical, especially when viewed from certain angles. Remember, if you are truly a bodybuilder, symmetry is the main priority. Size and definition mean nothing if symmetry is irregular. 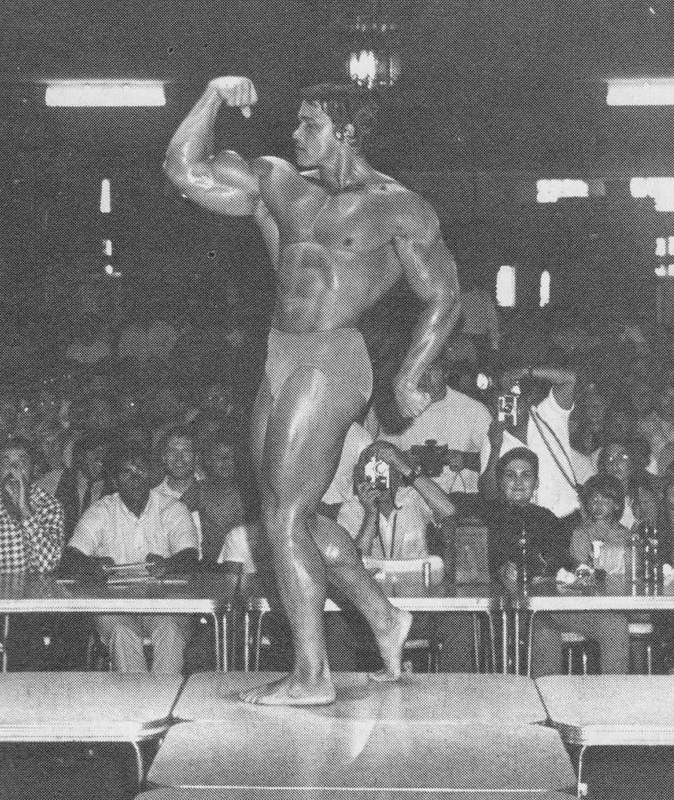 All muscles must be developed in relation to each other and must have just the right amount of size and development in order to achieve the winning look. Not only must the various muscles of the back be developed in relation to each other but they must also be in symmetry the rest of the body. If they are not, the symmetry of the whole body is ruined. Pure and simple. When fully developed that back creates that sought after V-shape that makes the body look so wide from the front and back while also showing depth and thickness from the sides. Also keep in mind that the traps and lats when fully developed can be seen from the front and greatly enhance the body regardless of which angle it is viewed from. The back when fully developed not only makes you look impressive but balances out the body by tying together all the major muscle groups of the body: the deltoids, pectorals, abdominals, thighs, glutes, and neck. Failure to work hard on your back actually limits your upper body size. Most beginning bodybuilders don't realize that back training is the key to building maximum upper body size. Bodybuilding expert Bob Green says that "most of your upper body bulk will be determined by the amount of back work you did in your first five years of training." Think about that for a minute. To put it another way, how well you develop your back will ultimately determine how big your upper body will grow. You will never reach your maximum upper body size until your back is developed to its ultimate potential. Why is this so? Firstly, your back is the basic structure of your upper body. The larger you build the structure, the more muscle it will hold, hence the bigger you will become. The back also contains the largest muscles of the upper body and it is well known that bigger muscle groups have the most influence on your size, weight and mass. That is, greatly increasing the size and mass of the big muscle groups has much more effect on your overall body than increasing the size and mass of the smaller muscle groups like the pecs, delts and arms. Think of it this way. Say you have two muscle groups and hypothetically speaking group one weighs two pounds and group two weighs ten pounds. Through training you manage to double the size of both. That is, group one now weighs four pounds and group two twenty pounds. By doubling the size of the group one, you have only gained two pounds of muscle. But by doubling the size of the second group you have gained a whopping ten pounds of muscle. Obviously the larger muscle has had more effect on your overall body weight size than the smaller muscle. Now relate this to the back. Doubling the size of the large muscle groups of the back (the lats and the traps) will literally transform your physique and give you that look of size and power. The practical reasons for doing back work - health reasons and preventing back injuries - are also of paramount importance. It is said t hat nearly everyone will at one time in their lives experience a bad back injury and live with back pain. Look at your back training as preventative medicine. If you injure your back it will greatly retard your progress, not just of your back but your entire body. Don't believe it? Try working out with a bad back and see how heavy you can train, if you can train at all. You'll be lucky to use 1/4 of the weight you usually handle in exercises for every body part. The muscles of the back give support to the body and allow you to use heavy weights in all upper and lower body exercises. The basics such as squats, presses, curls, laterals, and even bench presses, flyes and dips are vital to adding muscular size to your body and all require the back for support. Hurt your back and training can be set back for months, even years. Before getting into actual routines, exercises, sets and reps let's go over some of the errors people make while back training. The biggest error is using too much weight, so much weight they much cheat and utilize poor form to complete the various exercises. Most bodybuilders are into the 'weightlifter' mentality and are more concerned with how much weight they use rather than how hard the muscles work. Heavy weights are important and some cheating has its place but it must be utilized intelligently and with the purpose of making the muscles of the back work more diligently and strictly. Use heavy weights, yes, but only as heavy as will allow good form. Cheat, but at the end of a set. If you have to cheat from the first rep the weight is too heavy. Try and get at least 4-6 strict reps out of the exercise before you begin to cheat. Cheat as little as possible. Cheat only to make the rep possible, not easier. It only takes a small deviance from correct form to change the angle of attack. This shifts the stress from the intended area of the muscle onto another. Sloppy form can shift the stress onto a completely different muscle group. This is especially true of beginners who fail to make a strong mind-body connection with regards to isolating the back muscles. They can't see their backs as they train and find it difficult to concentrate and isolate the specific muscle groups or parts. Beginners often allow the muscles of the shoulders and arms to take over, depriving the back of much needed work. Or they transfer the work onto another muscle. Bodybuilders often perform pulldowns ostensibly for the lats and yet all the stress will be on the traps and biceps. Even more advanced bodybuilders who should know better cheat more than they should because they really believe the heavier the better. Do you want to know the secret of bodybuilding? The real secret that every top champion uses? Here it is. The weight is merely a tool that you use to make the muscles work hard. One difference between Mr. Superstar and you is that he realizes that point and utilizes the weight to isolate the muscles, forcing them to grow. He realizes that heavy is good but only up to a point. Deep concentration and control of the weight builds muscle far more effectively than tossing heavy weights loosely around. Using speed and momentum to cheat a heavy weight through a movement may look impressive and may build some power and tendon strength but it certainly will not build quality muscle. Controlled lifting of the weight, so that you feel it in the correct muscles, enabling you to fully contract the muscle, certainly will. To work your back muscles properly you must first mentally get in touch with every cord, every fiber. Because you can't see your back muscles as you train, close your eyes and mentally visualize your back working. Picture the muscle stretching and contracting. That's the first step. Do this on every rep. Don't just mindlessly pull on the weights and to through the motions. You must utilize strict form and a full range of motion. You must use deep concentration and you must feel the muscle working. If you don't feel the movement in the muscle you're trying to work, that muscle isn't working as hard as it should. Other muscles are probably doing most of the work. Finally, you must try for a hard contraction on each and every rep of every set of every exercise. At first, perform your reps more slowly and with tension, controlling and feeling even if you must lower the weights by 15-25%. Get a good stretch on each rep and go to a full, hard contraction. The more stretch at the beginning, the harder the possible contraction at the conclusion. Hold the movement in a fully contracted position for a count of two and then slowly lower the weight, resisting with muscular control all the way down to a full stretch. Try to keep the muscle under muscular tension throughout the whole rep. Never let a muscle relax, throughout the entire set. "Alright already!" I can hear you screaming. "Give us the damn routine so we can get on with the job of building our backs!" Actually, there just isn't one definitive routine that will give you complete back development and not everyone responds the same to every exercise. Not everyone has the same needs. Some need more width than thickness, some more thickness than width, some may need special attention to the lower back area, etc. So you will have to determine your own battle plan. I will outline the exercises to do it. Sets will depend on your level of development. Reeves deadlifts - 3-4 sets of 6-10 reps counting a warmup set. Wide grip chins - same. Reverse grip rows or pulldowns - same. Power cleans - 3-4 progressively heavier sets of 3-5. Deadlifts - same as power cleans. For intermediates I would suggest splitting up the routine so that the trap work was done on a separate training day, say along with the delts. Advanced people would perform five sets for each exercise, two or exercises from each list, three to four if a great deal of improvement is called for. I leave that to your own discretion. Advanced trainees may wish to utilize super-sets, forced reps, etc., to intensify their training. All bodybuilders should reinforce their grips with straps during back training. Straps enable you to go through those extra couple of reps, those that are the difference between adequate gain and extraordinary results. If you have really narrow shoulder blades, try a super-set of Wide grip chins and Reeves deadlifts. For those of you not familiar with the Reeves deadlift, it is a deadlift performed by grasping the rim of the plates on an Olympic bar. You must have this type of Olympic plates with the large lip on the outside enabling you to grasp the lip using only the thumb and fingers. This exercise really pulls out the scapula. Consistent work on this exercise will result in widening of the shoulders and upper back attachments. Work to failure on the chins and then perform as many Reeves deadlifts as possible. After the last deadlift rep, switch quickly to shrugs while still holding onto just the rim of the plates. Rep out as many as possible. To intensify the exercise further, try a tri-set of Wide grip chins to failure, Wide grip pulldowns to failure, then finish with Reeves deadlifts and Shrugs also to failure. Performing pulldowns after chins enables you to isolate your lats more effectively. The Reeves deadlifts place an incredible pull on the shoulder blades and upper back. I guarantee you'll feel this one. On all chins and pulldowns use a thumbless grip and arch the back. This lessens the bicep involvement in these exercises. The arching of the back is the only way to really work the lats properly. Try to pull the elbows back as far as possible on all rows and pulldowns. Contract the muscle as intensely as possible in the fully contracted position. Try and hold all movements in the contracted position for a full 2-count. Remember to go from a full stretch to full contraction. After you have performed a full set this way, go through as many partial reps as possible to further work the muscle. Over the course of a year you should consistently change the exercises you use in your workouts. Try every exercise on every list I've given. Give each exercise a fair trial - at least 2-3 weeks. Eliminate the exercises that don't seem to work, disregard the exercises that aggravate or cause injuries for you. Everyone is build differently and not everyone will respond the same to each exercise. Remember to do at least one exercise from each list. You cannot neglect the traps or the lower back and hope to build a complete back. If you perform at least one exercise from each list, and work the exercise properly until the desired muscle is pumped, I guarantee your back will grow wide, thick and muscular. Get into that gym and do it! You now have the knowledge. Quit bullshitting and get on with it!